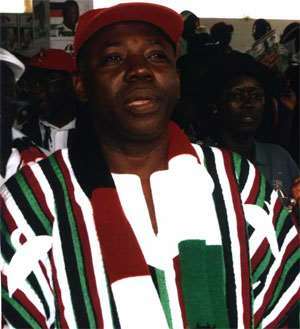 Accra Nov. 21, GNA - Alhaji Mohammad Mumuni, National Democratic Congress (NDC) Presidential Running mate for Election 2004, on Sunday said the NDC lost the 2000 election because God wanted Ghanaians to know the difference between the NDC and the New Patriotic Party (NPP). He said: "Before the 2000 Election, NDC supporters were praying to God to help them win the elections, but God wanted to tell Ghanaians how good the NDC was." Alhaji Mumuni, who was addressing a rally at Teshie in Accra, said people should measure the many achievements of the NDC and the good policies spelt out in their manifesto and vote the Party back to power. The NDC Presidential Running Mate, who is still recovering from injuries he received in a motor accident about a month ago, said: "I am as fit as a fiddle by God's Grace." He said the NDC was sure to win this year's election as Ghanaians had regretted voting for the NPP in the last elections. The NDC, he said, had opted for social democracy and would improve the capacity of the economy, adding: "We will create permanent jobs and not jobs for vote catching purposes." "NPP has no room for the aspirations of the ordinary Ghanaian, they are over concentrating on the macro-economic indicators while poverty is on the increase." Alhaji Mumuni introduced Nii Nortey Dua, the NDC Parliamentary Candidate for Ledzokuku to the electorate. Dr Josiah Aryeh, NDC General-Secretary, described the NPP Government as a "family and friends government" and called on Ghanaians to vote them out of power. "Voting them out is a divinely ordained task," and Alhaji Mumuni's speedy recovery was a sign by God to show that NDC should lead the country again. Nii Nortey Dua said there was the need for more secondary schools in the area. He said a community of over 90,000 people had only one secondary school to boast of and said he would do his best to improve the only secondary school in the community when voted into Parliament. The NDC Parliamentary Candidate said he would also establish an educational endowment fund for brilliant but needy students in the Constituency. Mr Joshua Alabi, Greater Accra Regional Chairman of the Party, said the NPP had failed to destroy the NDC. He said the Party would regain 20 seats out of the 27 seats in the Greater Accra Region.